2014 Cascadia® Evolution has surpassed more than 15,000 orders since the model's start of production in March 2013. 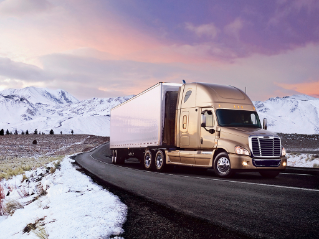 The Cascadia Evolution is pacing the industry in terms of order intake for long-haul applications that demand the highest level of fuel efficiency. "Surpassing 15,000 orders highlights the demand from our top customers to acquire today's vehicle benchmark in terms of fuel efficiency," said David Hames, general manager, marketing and strategy, Daimler Trucks North America. "The Cascadia Evolution provides the industry a truck that pays immediate dividends by dramatically reducing overall total cost of ownership."